By Nancy Howat BSc (Hons), and Hilary Jacobson, CH.HU.SI. For many women with polycystic ovary syndrome (PCOS), fertility issues may have been a real problem. It can seem that to be faced with further difficulties when trying to breastfeed is even more unfair. As a medical writer I felt a strong need to communicate any help and information I was able to find to other mothers who may be having problems. My co-author Hilary Jacobson experienced low milk supply as a result of PCOS and it was this experience that led to her work with low supply mothers and also her research into the foods and herbs that can be useful during lactation. In this article we will provide some basic information for mothers who suspect that PCOS may be the cause of problems in their breastfeeding relationship. 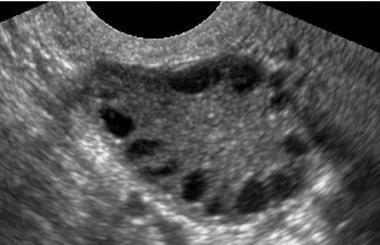 What is Polycystic Ovary Syndrom (PCOS) ? PCOS is a hormonal imbalance that is thought to affect between 10 and 15% of women. It can affect women in many different ways. The range and severity of symptoms is so variable that there is no globally accepted clinical definition of PCOS. Rather, a diagnosis must be made from a combination of symptoms. These can include an irregular or late onset of the menstrual cycle, fertility problems, recurrent miscarriages, excessive body or facial hair, head-hair loss, acne and weight problems. Insulin resistance and blood lipid abnormalities are also very common. Gestational and adult-onset diabetes can also occur. PCOS is now seen as a potential marker for heart disease in women due to insulin issues. It is therefore very important to get a timely diagnosis of PCOS, to seek treatment, and to enact lifestyle changes that can improve a mother’s health now and in the future. While PCOS symptoms usually start in adolescence, in some women they do not develop until their early to mid-twenties. While PCOS is treatable, and long term improvement is obtainable, there is not a cure. Why is PCOS Thought of Having an Effect on Milk Production? According to Lisa Marasco1, the IBCLC whose breakthrough research revealed the connection between PCOS and low milk supply, there are several different ways that PCOS could potentially interfere with breastfeeding. Due to the hormonal imbalances which occur, there is the potential for poor breast tissue development during puberty and pregnancy. Fewer menstrual cycles in early puberty can translate into less estrogen to develop mammary tissue. Prolactin and oxytocin are two of the main hormones involved in the onset of lactation. Women with PCOS have higher levels of androgen hormones that can interfere with prolactin reaching its receptors. In addition, if too few prolactin receptors were formed during pregnancy, milk production will be limited. Estrogen is known to inhibit lactation, particularly in the early days after delivery. Women with PCOS typically have an imbalance called “estrogen dominance.” If estrogen levels are not down-regulated after birth, circulating estrogen may interfere with lactation. This is why the contraceptive pill is not recommended for breastfeeding mothers. Insulin resistance may affect breast growth and milk synthesis. Insulin is known to be an important factor in lactation in conjunction with prolactin and cortisol. What Can Be Done to Regulate Milk Production in Women with PCOS? Lisa Marasco1 has found that approximately one third of women with PCOS have normal milk supply. One third has an overproduction of milk. Another third have some degree of low supply, but only one third of these again (one ninth of women with PCOS) will have a real struggle to produce any milk at all. Working with a breastfeeding expert such as an IBCLC or La Leche League Leader can be helpful in developing a strategy for your particular situation. It is worth remembering that although the following advice can improve milk production in many women with PCOS, it may not be possible for all mothers with PCOS to achieve a full supply. This is not a failing on the mother’s part. Any breast milk is beneficial. Women with PCOS often have severe sugar cravings, and dealing with these cravings can be quite challenging. Certain supplements such as the minerals chromium and vanadium can help. Insulin resistance, a key symptom of PCOS, plays a role in sugar cravings. It is worthwhile to follow dietary principles to improve insulin sensitivity: Avoid foods that lead to a sharp spike in blood sugar, and prefer foods with a so-called low glycemic index (GI). It is best to begin with dietary changes before pregnancy. Do not use a no-carb or extremely low-carb diet long-term, as these can lead to nutritional deficits. If you do need to eat a low-carb diet for a while to treat an extreme case of insulin resistance, do so under the guidance of a nutritionist who specializes in PCOS. Useful books include The New Glucose Revolution Guide to Managing PCOS: The Essential Guide to the PCOS-Glycemic Index Connection (New Glucose Revolution) by Jennie Brand-Miller, Kate Marsh and Nadir R. Farid, and also The GL Diet by Nigel Denby. Breastfeeding is a time when all mothers naturally tend to crave sugar. Remember that breastfeeding removes sugar from the blood, making time while breastfeeding a different situation from other times. For instance, diabetics frequently see improvement while breastfeeding because breastfeeding naturally lowers their blood sugar. This removal of sugar requires a regular tanking of new sugar from food that contains more natural sugar, higher on the GI list, such as fruit, starchy grains, and sweet vegetables. A mother’s sugar craving while breastfeeding is actually the body’s call for naturally sweet whole foods such as barley, millet, rice, carrots, beets, yams, sweet almonds, and fruit that also, as a side-benefit, boost a mother’s milk supply. While breastfeeding, a mother can beat her sugar cravings and maintain steady blood sugar levels by eating and snacking every two to three hours on healthy, whole foods. Getting healthy fats and a source of protein with each meal or snack will also help keep blood sugar levels steady. Mother Food for Breastfeeding Mothers by Hilary Jacobson provides advice on regulating insulin resistance and blood sugar levels through the use of diet and herbs. As for dieting to lose weight, a common concern of mothers with PCOS, remember that actively trying to lose weight while breastfeeding can damage a shaky milk supply. For low-supply mothers, even a small but sudden weight loss can translate into significantly less milk. Slow and steady does it. There is time ahead to lose weight. Take time for yourself. Ask a helpful family member or trusted friend to occasionally take care of your baby. Rest or enjoy a few quiet moments when the baby is sleeping. Take a warm bath, try yoga or meditation, relax in front of TV with a warm drink, or read a good book or magazine. Exercise has been shown to help with levels of stress hormones in the body: take the baby out for a walk, dance slowly to your favorite music, do a bit of low-strenuous exercise. Get plenty of sleep. Arrange your sleeping arrangements so that your baby is close by for night feedings. Let household duties go and actually take that nap while your baby is napping. Try to reduce the amount of caffeine in your diet (tea, coffee, cola and chocolate). The stress hormone adrenaline is stimulated by caffeine, and many mothers say they notice an improved let-down when they reduce caffeine. A selection of herbs which help the body prepare for lactation can be started during pregnancy and continued when the baby arrives. Examples of these are alfalfa leaf, red raspberry leaf, nettle, oat straw, dandelion leaf and red clover. For more information on the use of these herbs during pregnancy and breastfeeding, the book Mother Food for Breastfeeding Mothers by Hilary Jacobson is a useful resource. Be sure to read up on herbs before beginning any herbal protocol. The MOBI Herbal contains pertinent information on red raspberry leaf during pregnancy. One herb which encourages glandular growth in mothers, and is therefore a favorite of PCOS mothers with minimal mammary tissue, is goat’s rue. This herb contains a compound similar to the drug metformin, which is also useful, anecdotally, for the development of glandular tissue. Metformin is a drug which improves glucose tolerance; it was originally licensed for patients with type II diabetes. Metformin works by reducing glucose production in the liver, and it enhances receptors in the body to the presence of insulin. What it does not do is trigger the production of more insulin. It therefore does not cause low blood sugar, and is considered very safe, though you should only take it with your physician’s approval. Some women with PCOS find that symptoms return after birth, including weight gain, fatigue and depression. Taking metformin can help with these symptoms. Recent studies have shown that metformin can also be beneficial in some women with PCOS 2,3. Although the use of metformin has not been assessed in clinical trials for its effects on milk production, anecdotal evidence suggests it could be beneficial. A study on the transfer of metformin into milk has been carried out. This showed that a nursing baby would receive only 0.28% of the weight adjusted maternal dose – considered quite safe for healthy infants4. Domperidone (Motilium™) has been used successfully by many women to increase breastmilk production. Studies show that domperidone works to increase milk production and that it is considered safe for both mother and infant5,6. Although domperidone is not manufactured or sold in the United States, it is obtainable from a compounding pharmacy with a doctor's prescription. Domperidone is also available overseas. To legally purchase domperidone in the United States, talk to your doctor about getting a prescription. Consult Dr. Jack Newman's information found at: http://www.kellymom.com/newman/19a-domperidone1.html and http://www.kellymom.com/newman/19b-domperidone2.html These informational fliers may be printed out and taken to your doctor. Dr. Newman's thoughts on the FDA standing on domperidone can be found at: http://www.breastfeedingonline.com/OfficialDomStatements.shtml. About a third of all mothers with PCOS experience pronounced chronic over-supply. This situation can be just as difficult to manage as low milk supply. While the same general advice applies to mothers with PCOS. Overcoming the tendency to overproduce can take time, up to several weeks in some extreme cases. Hopefully, if you are patient, you will soon see improvement, and you and your baby can enjoy a more relaxed experience at the breast. For general information on PCOS, a useful resource is http://www.verity-pcos.org.uk. Mother Food for Breastfeeding Mothers by Hilary Jacobson. published by, PageFree Publishing, Inc. ISBN: 1589612299. Genazzani AD, Strucchi C. et al. Metformin administration modulates neurosteroids secretion in non-obese amenorrhoic patients with polycystic ovary syndrome. Gynecol Endocrinol 2006 Jan 22 (1): 36-43.
da Silva OP, Knoppert DC, et al., Effect of domperidone on milk production in mothers of premature newborns: a randomized, double-blind, placebo-controlled trial. CMAJ. 2001 Jan 9;164(1):17-21. Hofmeyr GJ, Van Iddekinge B, Blott JA., Domperidone: secretion in breast milk and effect on puerperal prolactin levels. Br J Obstet Gynaecol. 1985 Feb;92(2):141-4.